Thinkspace is committed to enabling 21st Century Learning through creative and flexible spaces; empowering a school culture to evolve and transform supportive teaching and learning. Thinkspace’s recent projects such as Norma Rose Point K-8 School and Centennial Secondary School, implemented many 21st Century Learning principles, such as flexibility, adaptability, daylight and transparency, as well as safety, visibility and supervision. Click here to watch a video created by Fielding Nair International about Norma Rose Point. 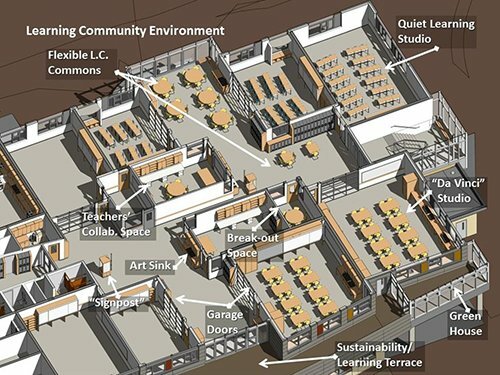 By extension, supportive space for learning must be flexible and agile in its ability to support varied modes of learning; it must provide environments that support teachers’ and student’s needs, be they intellectual, physical, social, or emotional; they must provide the tools to easily access information, digest it, and re-work and personalize it; they must support both individual and collaborative effort. This kind of space for learning is not about grand gestures, but rather the fine fabric of supportive background space that allows the high standards necessary for “quality teaching and learning”. Space cannot create good learning, but it can greatly facilitate the learning process.